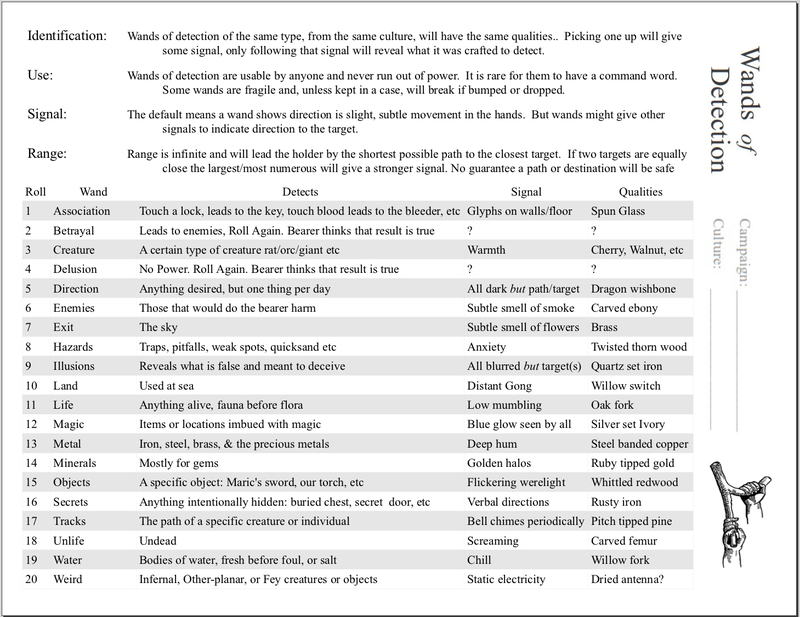 Here is a pdf of 20 wands of detection. Here is an editable file so you can use this framework but make it your own. Wands of detection seem like a really cool, old school item because they are leading you somewhere-- you have a hook and direction-- but you don't know where or what to expect along the way. I especially like the idea of the party having to identify the wand by following it to its target. Blasting wands can be limited to magic users but I think everyone should be able to pick up one of these things to see where they lead. Some versions of D&D give these charges and limited ranges as if they were powerful tools, but knowing a trap is about isn't the same as knowing how to get past it safely. Likewise, knowing a cache of gems is somewhere in the next room in no way helps you deal with the bugaboos that might own them. One kind of wand I didn't fit that I think would be cool is the breadcrumb wand, set a location and then later be able to find your way back to it. One signal I wasn't able to fit but think might be interesting, is: the wand gives the bearer a permanent idea of the location of the target until that location is visited. They don't need to have the wand any more. That means you could be searching for an NPC that knows exactly where the tomb of Zarglfarger is, but has never been there, etc. 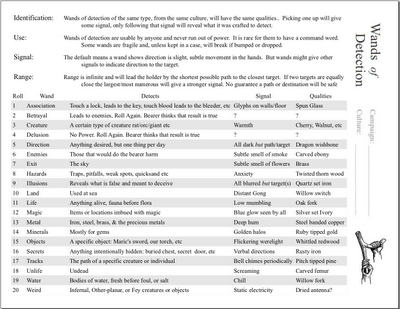 Wands with this kind of signal might be kept in mage guilds and used only by appointment or membership. Awesome! 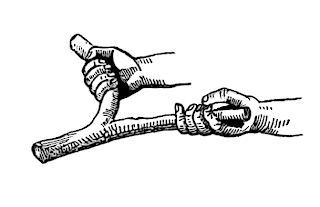 But what strikes me is that despite having a dowsing rod in the picture, this sort of behaviour (physically pulling in the direction of the target) isn't available as one of the 'Signals'. Based on the dowsing rod in the picture, that was my natural assumption as to how these would work while reading the first column, before getting to the 'Signals' column. When I got there, it was pretty surprising to find it absent. Why not use this to fill in one of the '?' results in the 'Signals' column? So the wand of exit points... straight upwards? Or else it picks out an actual route to the sky for you, but that implies that all the other wands do that as well, and I'm not sure I'd give my players an item that lead them around by the nose like that. I really hope you collect all these together at some point. It would make a nice booklet. @bombshelter13: yeah, I was trying to be efficient and use the 20 wands to show 20 possible signals, but you're right you could treat that column as an independent table to roll on with both "? "s as the default movement in the hands. Or you could disregard the signals all together and make all wands default to that. @John: I was too clever there for my own good, putting "the sky." What I had in mind was a party beaten up and lost finding a wand deep in a dungeon that would help them get out. But now that I think about it, you could make that wand the breadcrumb wand. Give it a command word, when it's spoken a location is locked in, when the word is said backwards the wands leads back to it. You could also have all the wands point as the crow flies, but I think that becomes a lot less useful. Maybe make lesser wands that do that and greater wands that lead along the shortest path. Remember the shortest path might lead through a medusa's lair and, depending how you rule "path" locked doors. @Roger: I might, but I'm hoping that these will be most useful for people to make their own, including ignoring some of the pages they don't need. I should have mentioned that Association wand was James' idea. I like it a lot because it is an open tool that I can't predict how players might use it, but yeah I'll probably make it like the Anything wand, usable once a day. I want to avoid charges at all costs because I hate bookkeeping. I much prefer wands to point as the crow flies, because it gives the players a direction, but doesn't inhibit exploration. If a wand picks out a path for the party, they have only two real choices: they can follow the path, or they can abandon it and go their own way. They might run into an obstacle they have to go around, but as soon as they've moved far enough away from it the wand will recalculate the new shortest route between them and their target and they can follow that. Maybe the shortest route isn't the safest, but since the players have no way of determining that, they have no reason to do anything other than follow the route picked out for them. What's more, the DM is doing all the work, calculating and recalculating the shortest route through a potentially large and convoluted dungeon on the players' behalf. Complex input from the DM resulting a simple situation for the players. A wand that points as the crow flies is still a useful tool, but it gives the players options and choices. The wand points southwest - do we take the south or the west passage? The west passage turns northwest after a while - do we keep going, or retrace our steps? The wand's pointing over this chasm - leap it or find a way around? The wand points through this dead end room - is there a secret door? How far away are we from the target - if we move up and down a bit, we should be able to guesstimate from the change of angle of the wand. The DM, for his or her part, just has to make a mark on the map and give the players compass directions. All complexity is generated by the environment and by the players themselves. Simple input from the DM leading to potentially complex situations for the players. I was thinking about the recalculating and worrying about it a little. I think the confusion and extra DM work from that convinces me that you're on the right track with using as-the-crow-flies dowsing. This is my inexperience becoming an obstacle. I guess I need to give my players a wand next session and see what happens. I still have a gut feeling that from the player's perspective more choices won't be attractive. A wand of metal detection that leads me right to the gold would be nicer and easier than one that shows its somewhere East. But, what we want isn't always what's best for us. If they're given the option, sure, they'll go for the pathfinding wand. The extra choices aren't supposed to be appealing, they're supposed to make it more fun by making it more of a challenge. It's like metal detector enthusiasts. There's real fun in following some vibrating stick through a labyrinthine dungeon until you've pinpointed that hidden treasure trove you never would have uncovered otherwise. Sometimes its a pathfinder, cuz its magic. Sometimes its a straight line. So we get out the protractor and do some triangulation. I get it.